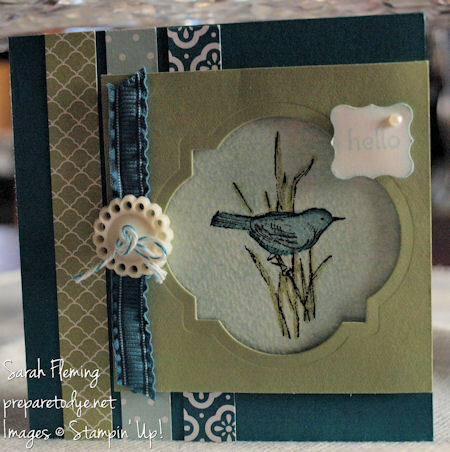 At Stampin’ Up! Convention a couple weeks ago, they were going for a world record — the most greeting cards sent from the same place at the same time. 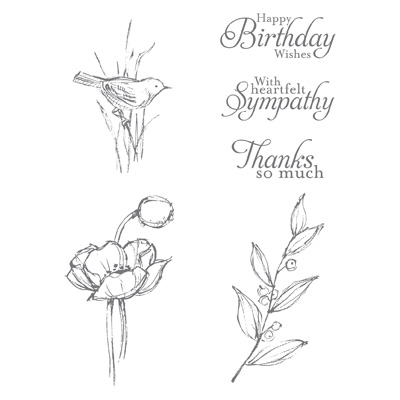 I made this card and planned to send it to my BFF, but the line was so long (they sent over 2,900 cards! ), and it was my first convention, so I didn’t want to spend my entire first evening in line. (They did set the world record, BTW.) My BFF will understand when I finally send it to her. I found the sketch at Splitcoast Stampers. This was my first time to use the new Simply Sketched stamp set (available for hostesses of a qualifying workshop) and also my first time to use the watercolor paper and markers. I stamped the image in StazOn black ink, then colored the grass in with a Pear Pizzazz marker. I outlined the bird with an Island Indigo marker, then used a blender pen to color in the rest of the bird, and finally sponged the background with Soft Sky ink. The window was cut using the Window Frames framelits, and I popped that layer up on Dimensionals just to give it a little extra… um, dimension. Do you love that button? I can’t get enough of the Very Vintage buttons. And I did have the twine tied in a neat little bow, but it got all smushed in my bag before I took a picture of it, and I didn’t notice until just now. Oops. 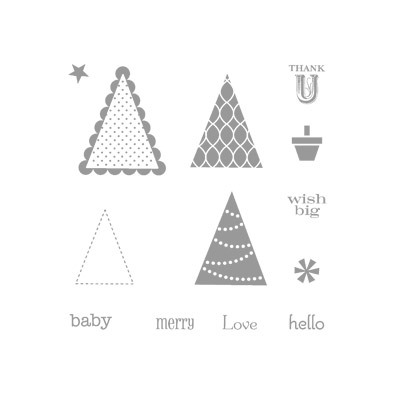 The “hello” sentiment is from Pennant Parade, one of my favorite sets for tiny words, and also a great set in general — very versatile, so many uses, especially when you pair it with the Perfect Pennants builder punch. Reminder: The deadline to subscribe for my August Stamp-of-the-Month Club is Monday, August 5. Comment here or at the original post or email me to sign up, and I will contact you. Have a great evening! I’m hoping my evening is much less eventful than last evening, when we had to take my daughter to the ER to make sure her finger wasn’t broken. Poor little sweetie has a bad contusion from getting her finger caught in a collapsing step stool.